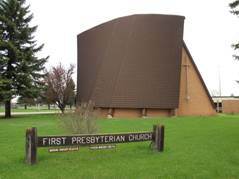 We think you’ll love to get to know First Presbyterian Church of Moorhead! Worship is at 10:30 am Sundays, and Sunday School is available for children, from 9:15-10: 15 am. Coffee Hour follows worship every Sunday, too. Whether you are exploring new church homes, attending college, or vacationing in the area, know that you are warmly welcome. First Presbyterian Church of Moorhead is a great size church for you. We average 80 in worship and have nearly 150 members. This means we are big enough to offer lots of programs, yet intimate enough to have a close church family feel. We have church members from Moorhead, Fargo, West Fargo, Oxbow, and more. Many new families have been discovering us recently and preschoolers are now our biggest Sunday School class. Our worship is intentionally uplifting, connecting the hope of Scripture with our everyday lives. Our Passing of the Peace is legendary, as everyone takes the time to shake hands and ‘pass the peace of Christ’. Children participate in a Children’s message with Pastor Robert about a 1/3 of the way through worship and then exit to Children’s Worship where they continue to worship in a child-friendly way. Communion is celebrated the first Sunday of each month. Nursery care is provided during Sunday School and Worship. Activities at our church include a monthly Book Club (last Tues. of the month 7-8: 30 pm), Women’s Bible Study (2nd Wed at 1 pm), Seniors Sneakers Exercise Class (Tues & Thurs 11-11: 45 am), and Choir (Wed at 7:30 pm). We share in Mid-Week Meals together at 6:00 pm every Wednesday Oct-April, followed by a Taize worship service from 7:00-7: 15 pm. Youth Group meets twice a month. We interact with the community through our Flower Ministry, monthly Dorothy Day Food Pantry volunteering, and support of Cooper House & Churches United local homeless shelters. More broadly we are involved in ministry in Kenya and the Bdecean Spirit Lake Reservation mission. We also have a wonderful Korean Congregation that worships here at 1 pm every Sunday, led by Rev. JaeJun Lim. There are many great things happening at First Presbyterian in Moorhead. Special Events include our February Cherry Pie Supper (where 500+ are served), June Bug Fun Run/Walk, Fall Talent Auction, and Summer Rummage Sale. We are thankful God led you to check us out online. We hope you are led to join in worship at First Presbyterian of Moorhead. We look forward to welcoming you in worship soon!